As Microsoft Dynamics CRM moves into the future by enabling information workers to access information across many devices and networks—environments in which time-to-load and consumption are the key success factors—we’re focusing more than ever on providing a fast-loading, consumption-oriented user experience. This focus is particularly helpful for people who use Microsoft Dynamics CRM primarily to consume data, rather than to edit or update records. To further these goals, in Update Rollup 7 we’re introducing a new feature called read-optimized forms. A read-optimized form displays a record very quickly. We achieved this by trimming the record to its bare essentials: just the data, with no ribbon, Web Resources, or form scripts. Need to edit a read-optimized form? Editing the record is just a click away. 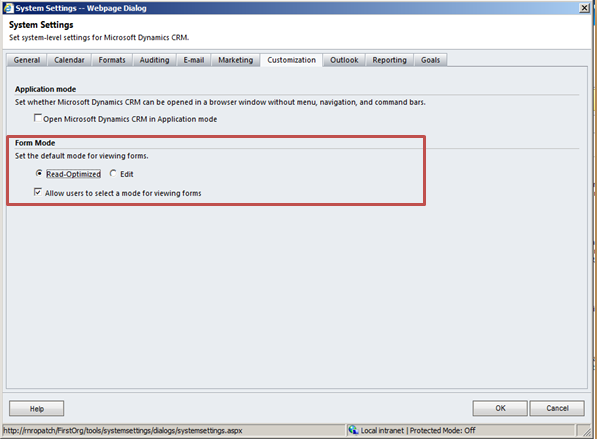 In Update Rollup 7, read-optimized forms are disabled by default. Because we’re introducing a brand-new experience in viewing records, we didn’t want to surprise you by turning it on as the default experience. We also know that some of you have form customizations using scripts and Web Resources. We’ve made sure that those experiences continue to work as expected. We plan to continue refining the read-optimized form experience in future releases, so that read-optimized forms will eventually become the default record-viewing experience. • When will you see a read-optimized form vs. an editable form? • Displays all fields, notes, IFrames, and sub-grids that are visible by default. • Honors all form- and field-level security configurations. • Does not display the ribbon or allow editing a record. • Does not display form navigation. • Does not display embedded Web Resources. • Does not execute form scripts. 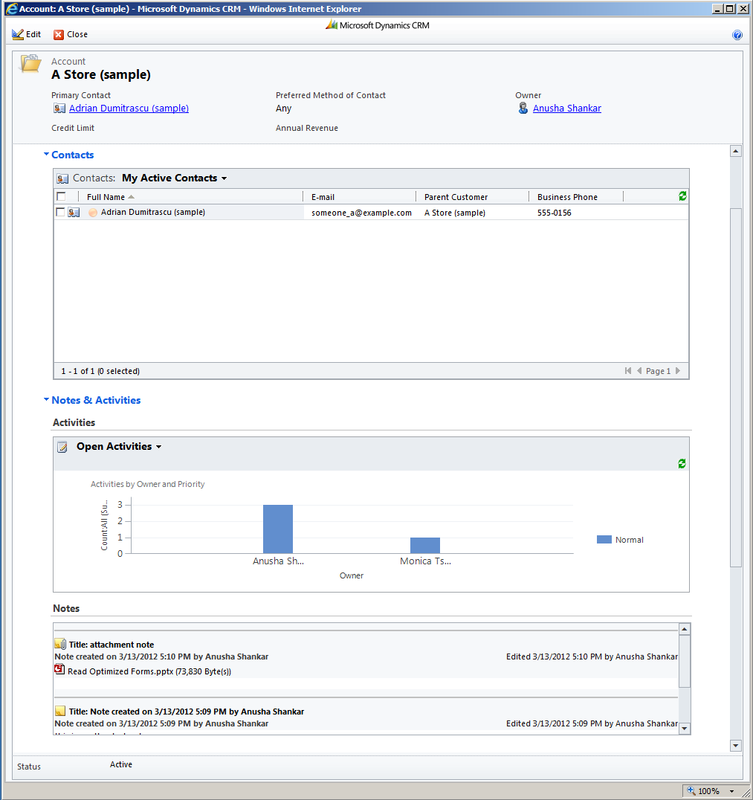 The following screenshots show read-optimized forms for a sample Account. If you’ve added notes to your record, you can view them in the read-optimized form. However, you’ll have to switch to the edit mode to add a new note or to edit your existing notes. Most of us have related records that show up as sub-grids in the main form. You’ll be able to view these sub-grids in the read-optimized form, and all common sub-grid actions like refresh, sorting, paging, and search will work. Also, if you have a sub-grid represented as a chart, it will render properly in the read-optimized form. However, since there isn’t a ribbon on read-optimized forms, ribbon actions on the sub-grid won’t be available. 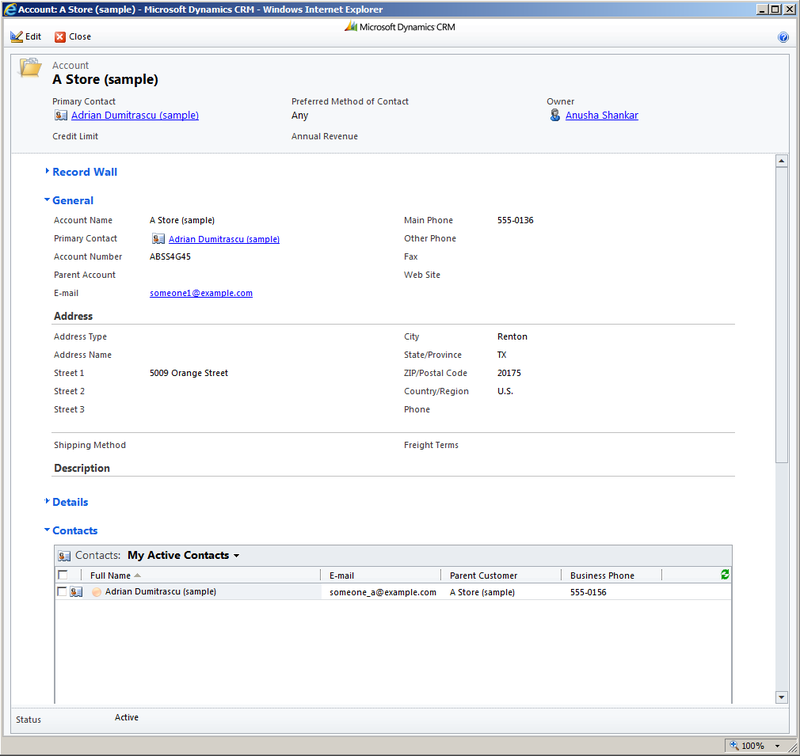 Some of us get data from external systems into Microsoft Dynamics CRM by using an IFrame, and seeing that IFrame in the context of your CRM record is very important to us. Because we realize the importance of your IFrames, we’ve enabled them on read-optimized forms. This is one of the places where a read-optimized form differs from the Outlook reading pane. However, if your IFrame calls in to the client API to get some form data, you might get errors on the form because read-optimized forms don’t have client API support. 1) On an open read-optimized form, click the Edit button in the toolbar. 2) Before opening a record, on the record grid, select a record and then click the Edit button. The default behavior when Update Rollup 7 ships will be to turn off read-optimized forms for all new and existing organizations. 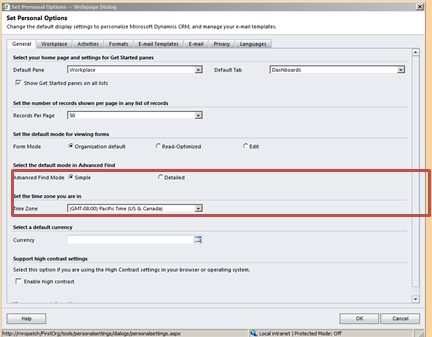 The admin or user will have to explicitly turn on the feature to enjoy the capabilities of read-optimized forms. The admin can set the form mode at an Org level, and also select individual users to use read-optimized forms. At the Org level, the admin can set the default form mode for all users by clicking Settings, Administration, System Settings, and then going into the Form mode area. Here, the admin also can control whether to give users the option to configure the form mode, or not. • If the admin selects Edit as the default form mode and disallows user configuration, users will always get editable forms. • If the admin enables users to change their default form viewing mode, all of their forms will load in the mode that they select (Read-Optimized or Edit). This individual setting overrides the organization default setting for that user. The admin can also select just a few users and change their form viewing default (for example, mobile salespeople who prefer to use read-optimized forms). This sets the default form mode for those users, and is also reflected in their User setting (Set Personal Options dialog). These users can change the form viewing mode if they want to. By default, users will get the organization default as their form viewing mode. However, if the user chooses a specific form mode, all of their forms will load up in the mode they select (Read-Optimized or Edit). The user setting will always override the Org setting for that user. When will you see a read-optimized form vs. an editable form? Many of you have form customizations that involve Web Resources and custom scripts, and we made sure that we didn’t break them. Because read-optimized forms don’t support Web Resources or custom scripts, we detect if your form has these components and then load the editable form automatically for you—ignoring the org/user settings. 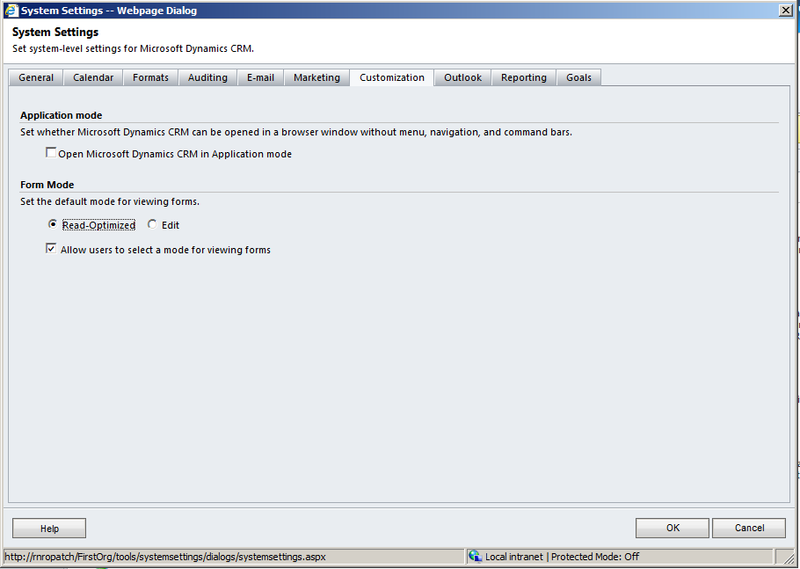 Information for developers is available in the Microsoft Dynamics CRM 2011 SDK topic: Design Considerations for Read Only Forms. 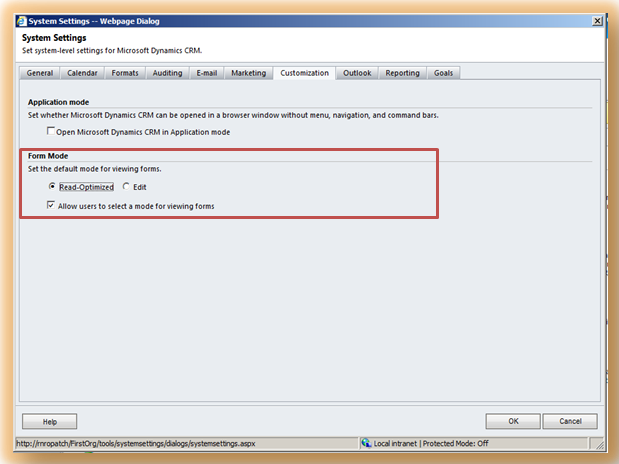 Information for business users and administrators is available in the Microsoft Dynamics CRM Resource Center: Usingread-optimized forms to view data more rapidly in Microsoft Dynamics CRM. I look forward to hearing your feedback on read-optimized forms. Just remember that you need to enable the read-optimized mode in order to use them!